Tooth-colored fillings are a safer and more attractive alternative to older silver amalgam fillings. By precisely matching tooth-colored composite fillings with the natural color of your teeth, Dr. Kinga is able to provide you with white fillings that are virtually invisible. The removal of amalgam fillings and replacing them with white fillings can create for you a more pleasing, silver-free smile. White fillings are made of composite resin and serve to fill cavities just like silver amalgam fillings. However, white fillings are matched to the color of your teeth and are virtually invisible. Tooth-colored fillings have become more popular over the years. As the availability of white fillings has increased and the possible dangers associated with mercury containing amalgam fillings have been publicized, more and more patients are having their cavities filled with beautifully white, tooth-colored fillings. 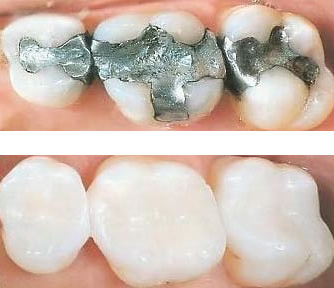 Many patients opt for the removal of their amalgam fillings as well. These patients want to enhance their appearance by ridding their mouths of unsightly silver fillings and replacing them with tooth-colored composite fillings. This simple procedure is an easy way to make a big difference in your smile. We are very proud to be a mercury-free practice.